(1) The ILL criteria (irritability, lethargy, low capillary refill) were applied retrospectively to a cohort of children presenting with petechiae who were part of a multicentre prospective study of MCD from Merseyside, UK.2 The ILL criteria would have identified all except two of 66 children with MCD and petechiae. Both those not identified presented with seizures, one had meningism, the other a maculopapular rash. However, the ILL criteria were also present in 62 of 65 children with petechiae initially thought to have MCD, whose final diagnosis was a viral illness. In this cohort the features that suggested MCD were tachypnoea or signs of meningitis or septicaemia.3 The ILL criteria are therefore of limited use in children already suspected of having MCD. Local paediatricians in training asked for an algorithm to help assess children with fever and petechiae. We therefore designed an algorithm which includes risk factors from previous studies (recently reviewed),4 the ILL criteria, the criteria from the above Merseyside study, and a period of observation. We introduced this algorithm into routine use in our hospitals this year. We are prospectively validating its use. (2) During the first three months, 49 children presented with petechiae. Only one child had meningococcal disease. The algorithm was correctly followed in 34 (68%) children; this included prompt treatment for the child with MCD. For 15 children the algorithm was not followed; 7 were given antibiotics when not indicated, 8 were not treated when the algorithm suggested they should be. It is obviously vitally important that antibiotics are not withheld from children with possible MCD. When paediatricians suspect MCD, they should give prompt antibiotic treatment and then seek to confirm the diagnosis. Any algorithm for the management of children with fever and petechiae must be shown to be clinically valid.5 A large number of cases will be needed to show our algorithm is safe and effective. This requires collaboration between a number of centres. Any centre wishing to help validate our algorithm would be welcome to do so: please contact one of the authors. (2000) The management of fever and petechiae: Making sense of rash decisions. Arch Dis Child 83:506–507. (1996) Who spots the spots? 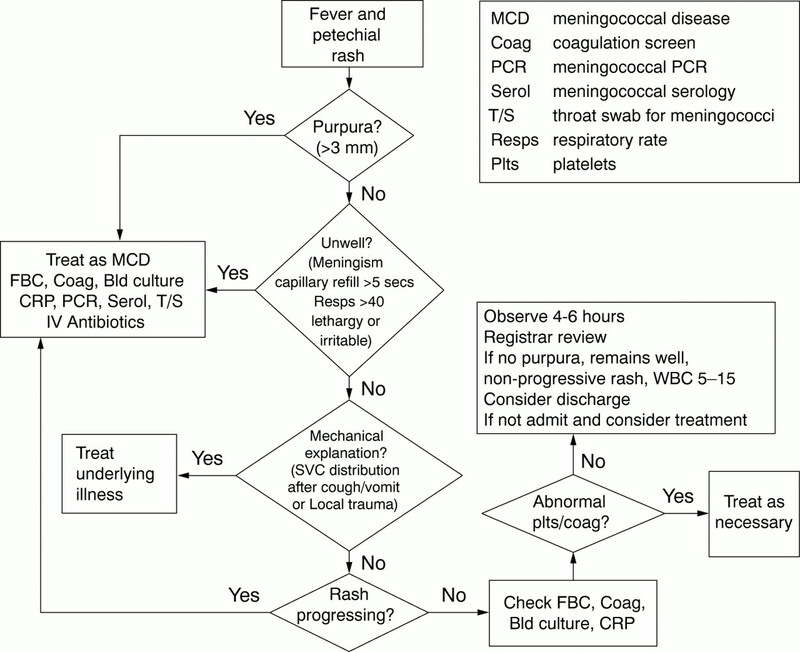 The diagnosis and treatment of early meningococcal disease in children. BMJ 313:1255–1256. (2000) Are paediatricians overtreating suspected meningococcal disease? [abstract]. Arch Dis Child 82 (suppl 1) A11. (2000) Fever and petechiae: No time for a rash decision. Clin Ped Emerg Med 1:132–137. (2000) Derivation versus validation. Arch Dis Child 83:459–460. Editor,—We read with interest the study and recommendations by Brogan and Raffles.1-1 We agree with them on a number of issues and wish to draw attention to the following points. (1) Previous international studies do not support a temperature of >37.4°C as an inclusion criteria of significant fever for significant bacterial sepsis (SBS).1-2 1-3 A minimum temperature of 38°C for 0–2 month old and 39°C for 3–36 month old children is recognised as an indicator of SBS. Hypothermia may also be significant. In children older than 3 years, the highest recorded temperature of 40°C or more, in association with other parameters, may be more significant. Interestingly, in their own series, 4 out of 5 children with SBS had temperatures of 38.9–40.4°C. We propose that a temperature of at least 38°C should be considered as significant fever. (4) The term toxic needs to be defined as a clinical picture consistent with a varied constellation of lethargy, poor perfusion, or marked hypo/hyperventilation.1-4 We therefore suggest that the aide memoir of significant bacterial sepsis should be modified from ILL to ILLNESS: Irritability, Lethargy, Low capillary refill, Neutrophilia/Neutropenia, Elevated (or low) temperature suggests Significant Sepsis. (1999) Evaluation and management of infants with fever. Pediatr Clin North Am 46:1061–1072. (1987) Observation, history and physical examination in diagnosis of serious illness in febrile children of less than or equal to 24 months. J Pediatr 110:26–30. (1993) Practice guideline for management of infants & children 0–36 months of age with fever without focus. Pediatrics 92:1–12. (1998) Predictor of occult pneumococcal bacteremia in young febrile children. Ann Emerg Med 31:679–687. Editor,—The accurate diagnosis of meningococcal disease is important, not only for the welfare of the patient, but also for the implementation of appropriate public health measures. Brogan and Raffles have made a useful contribution to more reliable diagnosis.2-1 However, I feel that their finding of 9% could represent a falsely low proportion of children with serious bacteraemia because of potential recruitment bias and measurement bias. Knowing that children would not be given antibiotics if entered into the study, unless they met the ILL criteria or had a raised white cell count or C reactive protein, may have led admitting doctors to exclude some children that they felt uneasy about observing. This could easily have been achieved by describing the rash as >2mm for instance (it is not stated whether the rash was measured or judged by eye). Secondly, it is questionable whether they had discovered all the bacteraemias. Blood culture, or remaining well after discharge, could miss bacteraemia in those children treated with antibiotics before admission or given a short course in hospital. PCR would have been a useful additional diagnostic test. This study is a useful first step but, as the authors say, needs to be followed up with a prospective trial. The recruiters and assessors of the children to the study are not the managing clinicians, and the diagnosis of bacteraemia is more thoroughly sought. This is important to validate the diagnostic technique and also the positive predictive value of the combination of petechiae and fever. Editor,—Although studies on children with petechiae who appear clinically unwell are important, the management of such children should pose few dilemmas in deciding to treat for presumed sepsis. A more challenging group is those with petechiae who appear to be well. We feel this group generates anxiety for clinicians who worry about missing occult or early sepsis. To address this question, we retrospectively identified from a 1 year period, all children who presented with petechiae to our emergency department. We wanted to focus in particular on well, afebrile children with petechiae of unknown cause. Therefore, unlike Brogan and Raffles, we excluded those at the time of presentation thought to have clinical sepsis, those with idiopathic thrombocytopaenic purpura or Henoch- Schonlein purpura and those with suspected non-accidental injury. We also excluded febrile children but, unlike Brogan and Raffles, we defined fever as a temperature of 38°C or more (in accordance with the study of Mandl et al,3-2 the largest prospective study to date on the incidence of sepsis associated with petechiae). Thirty one well, afebrile children with petechiae were identified. Each had comments in their notes like “appears well” and the diagnosis for each was “viral illness”, plus or minus mechanical causes for petechiae. In addition, objective criteria such as pulse oximetry, capillary refill time, and blood pressure were all normal. Having identified this cohort, we reviewed laboratory data and outcome for each child. Ten children were less than one year, 10 between one and five years, and 11 over five years. Nineteen had blood cultures done—all negative. Nine of these also had meningococcal PCR done—all negative. Of the 12 without blood cultures, 1 had meningococcal PCR done, which was negative. Twenty seven had full blood counts—3 showed an elevated white cell count and none had low white cell counts. Nineteen had C reactive protein measured, 9 of which were elevated. Twelve children were admitted—all remained well (despite this, 9 were given antibiotics, which were discontinued after 48 hours). Nineteen were discharged, having received no antibiotics. As far as we are aware, no children subsequently developed clinical sepsis. The results of our study are in keeping with those of Mandlet al,3-2 who found the incidence of clinical sepsis among (febrile) children with petechiae, who appeared well at the time of presentation, to be nil. Furthermore, our study shows that management of well children with petechiae is highly variable. Lack of consensus among paediatricians on the management of petechial rashes has been well documented.3-3 In our own department, we are considering implementation of the following guidelines for the management of well, afebrile children with petechiae, although we acknowledge that larger prospective studies are required. 1. That such children be observed in the emergency department for 4–6 hours and if they remain clinically well and afebrile, discharge without antibiotics would be safe. 2. Laboratory investigation is probably unnecessary, unless indicated to exclude ITP. (1997) Incidence of bacteraemia in infants and children with fever and petechiae. J Pediatr 131:398–404. (1998) Evaluation of febrile children with petechial rashes: is there consensus among paediatricians? Pediatr Infect Dis J 17:1135–1140. Editor—I was pleased to read the letter from Richards et al proposing a collaborative study to validate the ILL criteria. Firstly, I support this proposal fully. I was interested in their statement regarding the ILL criteria in those suspected of having meningococcaemia suggesting that the ILL criteria are of limited use. The abstract they refer to presented at the RCPCH meeting last year4-1 states that the presence of poor capillary refill, meningism, altered conscious level, or tachypnoea identified 28 of 32 children with culture proven meningococcal disease. 3 of the 4 children not identified had a maculopapular rash (ie not petechial?). Moreover, 12 of 32 children with meningococcal disease had total WCC greater than 15, but we are not told if any of the “missed” cases had abnormal total white cell count, or elevation of serum C reactive protein. In order not to miss any cases of invasive bacteraemia, a screening test with high sensitivity at the expense of specificity is desirable. We proposed that the ILL criteria, in its full form, when applied to children with fever and petechiae, operate as a “SnNOUT” test (if a test is highly sensitive, if that test is negative the diagnosis can be ruled out)for invasive bacteraemia. We cannot draw the same conclusions if only part of the risk assessment analysis is applied, or the risk factors are applied to children who do not have fever and petechiae. (2000) Are paediatricians overtreating suspected meningococcal disease? [abstract] Arch Dis Child 82 (suppl 1) A11.